ISIS seeks to survive in the dark corners of the world where local inhabitants lack the power and expertise to control the violent group, Dunford said. ISIS operates where it can exploit weaknesses in local government and local security forces, he added. Libya, Somalia, West Africa, certain places in Central and Southeast Asia are places where ISIS and like groups choose to operate. “If you think of those enablers as connective tissue between groups across the globe, our strategy is to cut that tissue, while enabling local security forces to deal with the challenges within their countries and region,” Dunford said. The United States is working with nations around the world to improve their military capabilities and capacities, Dunford said. U.S. troops, he added, have been working with forces from Niger for 20 years, the general said, training more than 35,000 soldiers from the region to confront the threats of ISIS, al-Qaida and Boko Haram. 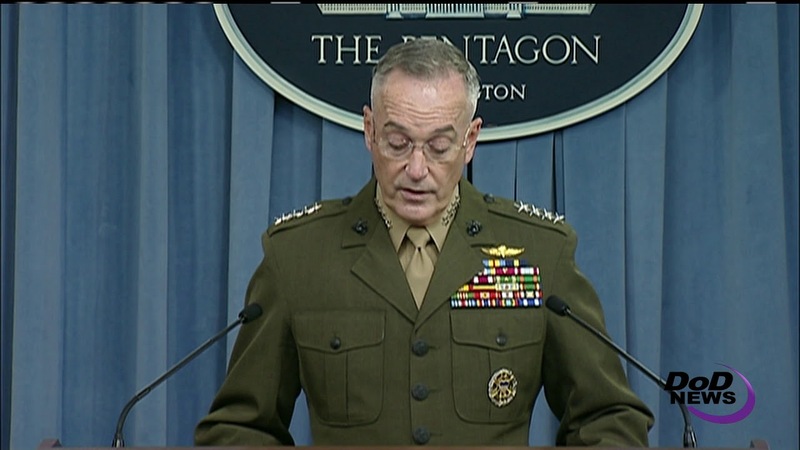 “Today, approximately 800 [U.S.] service members in Niger work as part of an international effort, led by 4,000 French troops, to defeat terrorists in West Africa,” Dunford said. 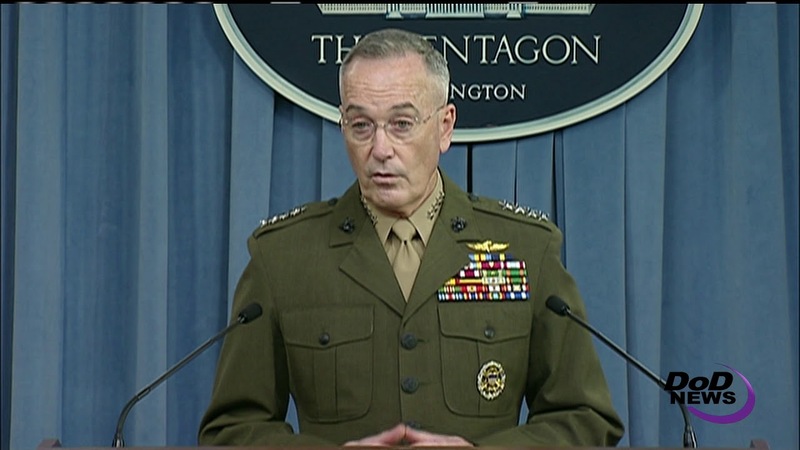 Dunford related what is known about the Oct. 4 operation in Niger. “On the 3rd of October, 12 members of the U.S. Special Operations Task Force accompanied 30 Nigerien forces on a civil-military reconnaissance mission from the capital city of Niamey to an area near the village of Tongo Tongo,” he said. The village is located a little over 50 miles north of Niamey, and officials expected the chances of meeting an enemy were slight. The next day, Dunford said, the forces began moving back, when they were attacked by approximately 50 enemy using small-arms fire, rocket-propelled grenades and technical vehicles. Still later, French attack helicopters arrived on station, and a Niger quick-reaction force arrived. During the firefight, two U.S. soldiers were wounded and evacuated by French aircraft to Niamey, and that was consistent with the casualty evacuation plan that was in place for this particular operation, Dunford said. Three U.S. soldiers who were killed were evacuated the evening of Oct. 4, Dunford said. “At that time, Sergeant La David Johnson was still missing,” the general said. The combat was tough and confused, the chairman said. There are more questions that need to be answered, he added, and that is why U.S. Africa Command appointed a general officer to investigate. The questions that need answers, he said, include: Did the mission of U.S. forces change during the operation? Did U.S. forces have adequate intelligence, equipment and training? Was there a premission assessment of the threat in the area accurate? And, How did U.S. forces become separated during the engagement, specifically Sergeant Johnson? And, why didn’t they take time to find and recover Sergeant Johnson? Dunford said. “We owe the families of the fallen more information, and that's what the investigation is designed to identify,” he said. The general said the campaign against violent extremists is making progress, but much more needs to be done. “Even with the fall of Mosul and Raqqa, we’re at an inflection point in the global campaign, not an end point,” he said. The general said he’s hosting the chiefs of defense and representatives from 75 different countries will meet to improve the effectiveness of the military network to defeat terrorism.